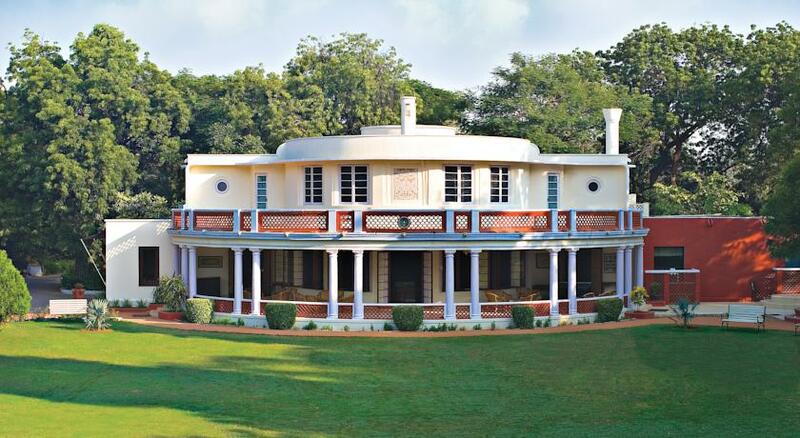 Sawai Madhopur Lodge is a luxury heritage hotel that offers an unparalleled stay coupled with services that will leave one feeling satisfied and happy. 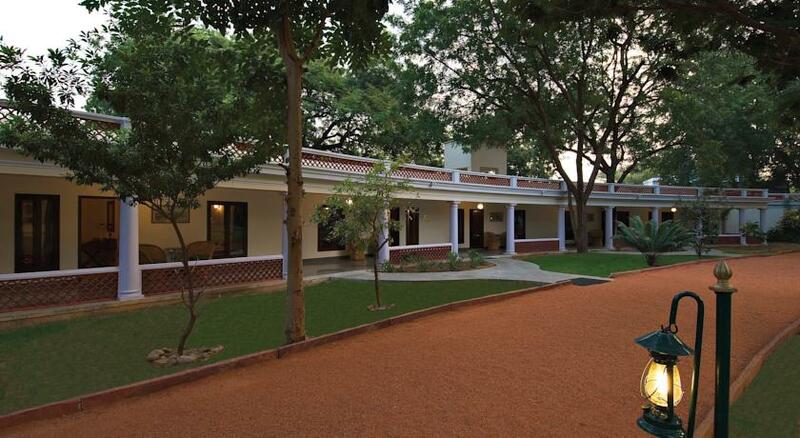 The lodge is just 5 km away from the railway station. 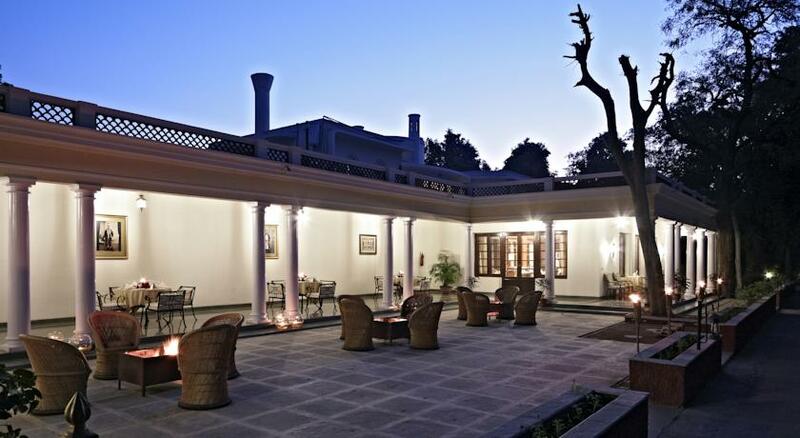 The lodge serves as the hunting house for the Maharaja of Jaipur and for his royal house and tents were pitched on the lawns with all pomp and glory of a king. The lodge holds within its walls 80 years worth of history. 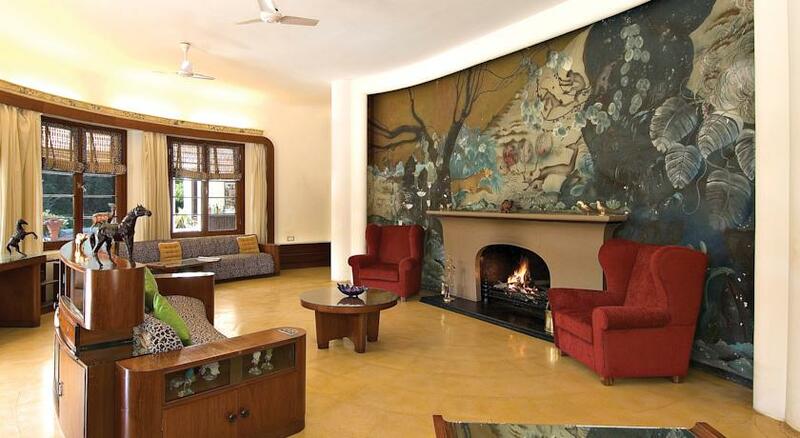 The architecture has remained the same and only a few things have been modernized for the guest’s convenience. The hotel’s pool is perfect for a lazy swim in the afternoons. Spread over 12 acres you can let your imaginations and your feet run wild and explore all you want. 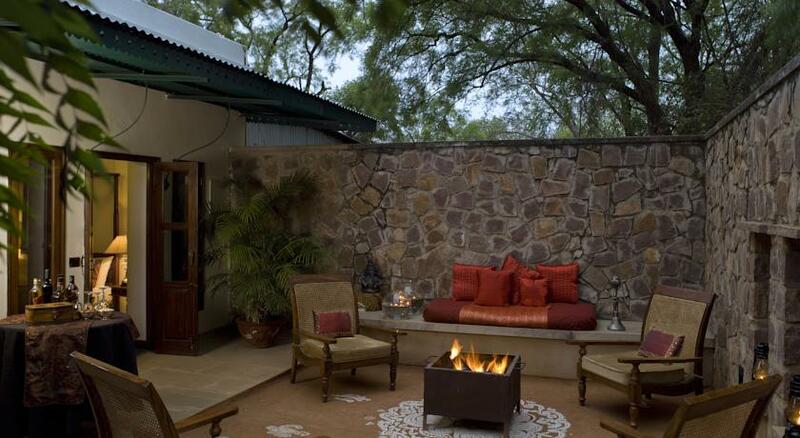 The in-house spa keeps your body feeling refreshed and rejuvenated with its various massages and treatments. The services offered are laundry services, arcade/game room, currency exchange, doctor-on-call, postal and parcel services, travel desk, shoe shine, indoor games and outdoor (pool table, table tennis, volleyball, cricket) concierge services, library, health club, limo or town car service and parking on site. The hotel has elegantly retouched rooms categorized into Premium Temptation Suite, Deluxe Allure Suite and Superior Charm. 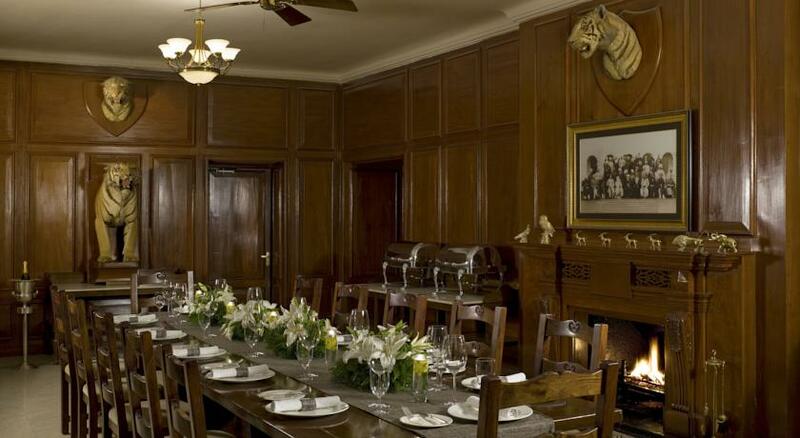 The Maharaja’ charming dining table is the pride and joy of the dining hall and serves as the main restaurant seating. 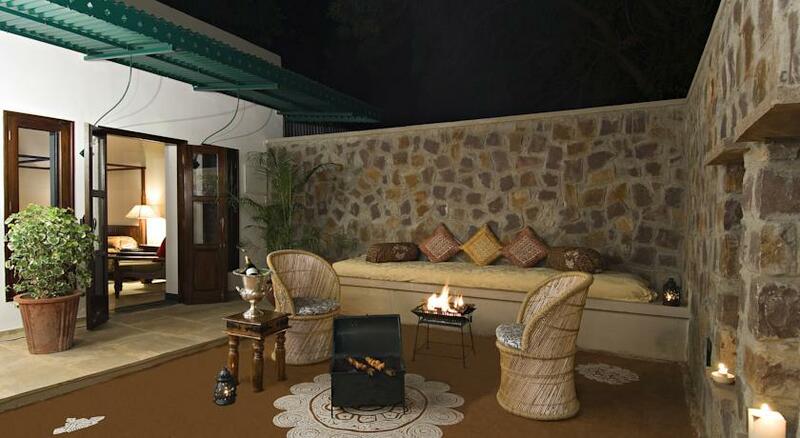 The Neem Terrace and the Tiger Bar are the other options. 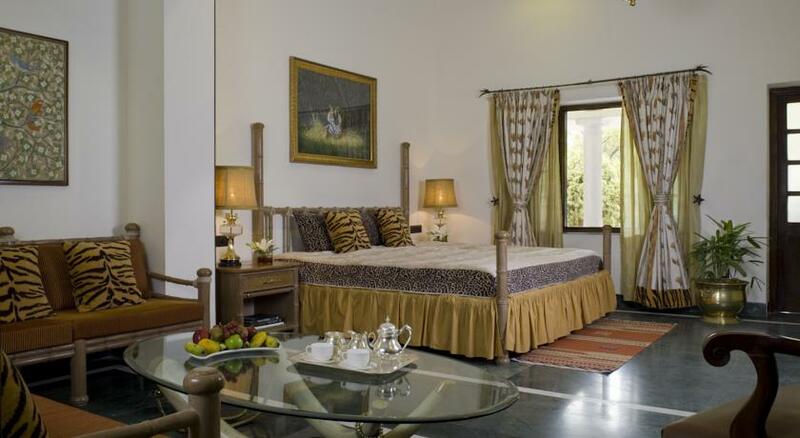 Premium Temptation Suites are how the Kings probably lived in their own times. These suites come with a bedroom, living room, bathroom and a private terrace. The private terrace looks out into the front lawns and makes for a great morning view. The amenities offered are T.V with DVD player, electronic safe, tea/coffee maker, daily newspaper, bottled mineral water, rest easy menu, cribs (on request), mirror, scale and hairdryer. The bathroom comes with pure cotton bathrobes and toiletries from Forest Essentials. Treat yourself Cabinet offers chocolates and drinks and are chargeable but tempting. 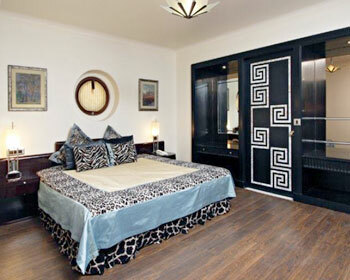 Deluxe Allure Suites come with a room and a private courtyard. 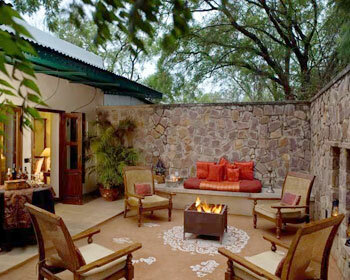 These suites offer a view of the gardens that lets in the fresh morning air. The rooms are modern in design and quite pleasing. The amenities offered are T.V, electronic safe, rest Easy Pillow menu, cribs on request, tea/coffee maker, mineral water, newspaper and Treat Yourself Cabinet (chargeable). The bathroom comes with Forest Essential toiletries and pure cotton bathrobes and is done in modern marble with a bold look that is quite appealing. 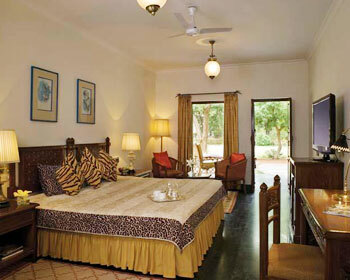 Superior Charm rooms are spacious, airy and comfortable. These rooms are done in contemporary style and are chic and stylish. The amenities offered are T.V, tea/coffee maker, mineral water, telephones, electronic safe, mirror, hairdryer, Treat Yourself Cabinet (chargeable) and cribs on request. 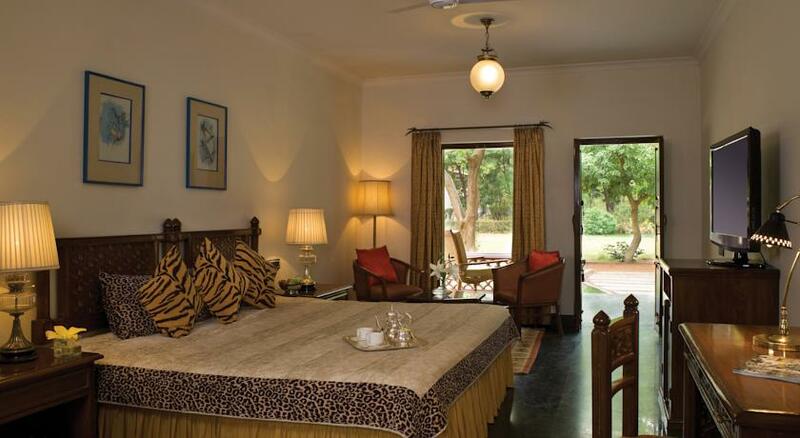 The bathrooms are newly renovated hence come with bathtubs, pure cotton bathrobes and Forest Essential toiletries. 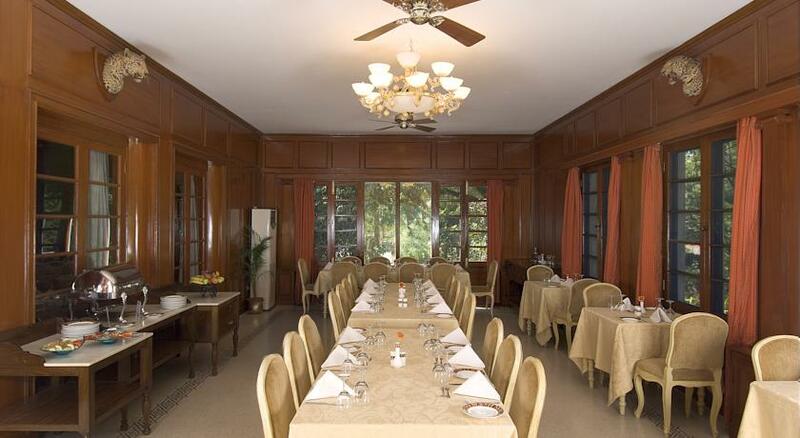 The main restaurant is housed inside and the dining hall consists of a large dining table on which the majestic Maharaja of Jaipur and his court used to dine. The restaurant offers an experience like no other. The talented and celebrated chef breathes life into dishes and it would be no wonder if you end up coming again and again. 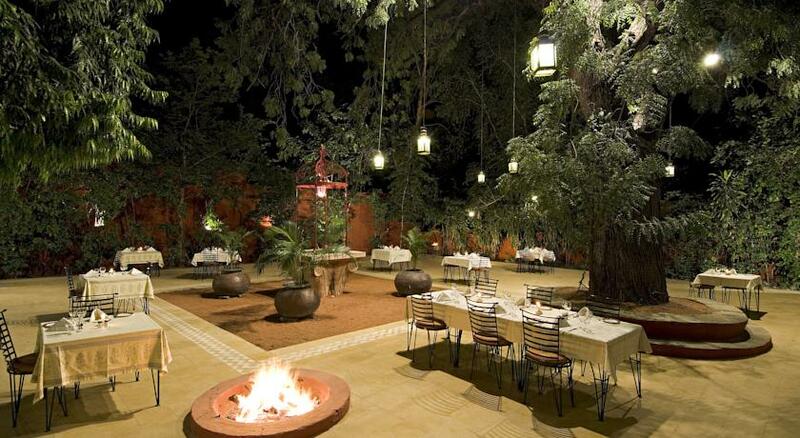 Dine under the stars with the night crickets and beings along with the sound of folk music and dance making up the main ambience of the place. The natural world serves as your dining hall and the bonfire only intensifies the beauty of the moment. An interactive live kitchen lets you witness the cooking that ends up on your table garnished with care. A true authentic and local experience awaits you here. 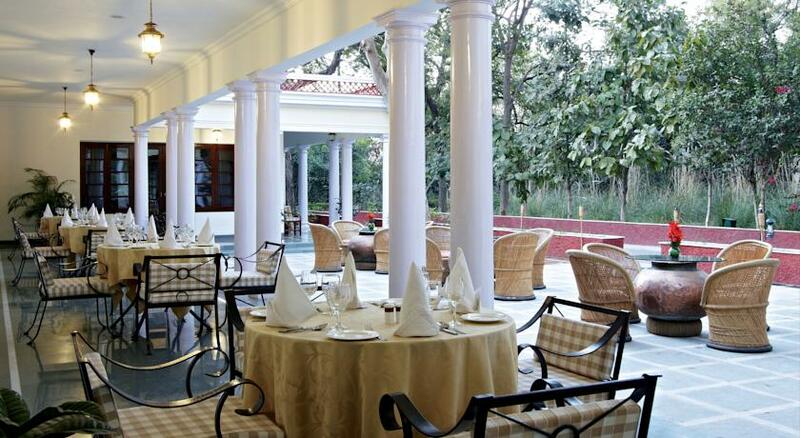 The menu is largely Barbeque, Rajasthani and North Indian. Dine beneath the stars in an intimate and cozy setting. The chef would be delighted to stun you with his culinary talents and happy to present his signature dish or a personalized menu if you wish to have that. 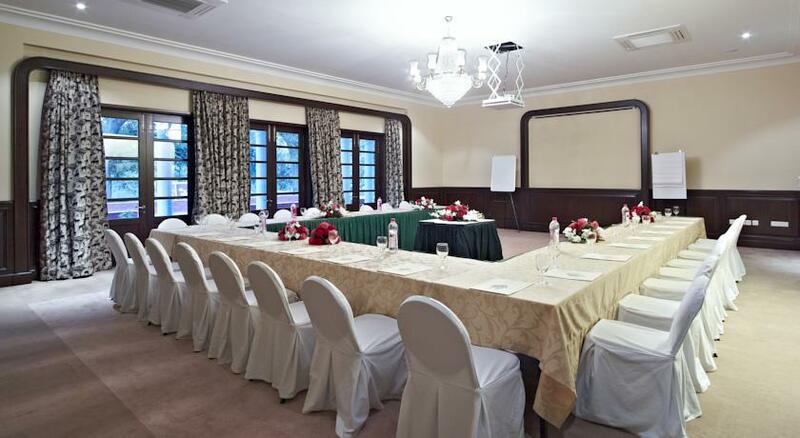 Music and other local entertainment can also be hosted to turn your private moment into a magical one. The hotel’s bar offers the finest of drinks from across the world. The bar offers a relaxed and calm ambience to let all the tension go away leaving only you and your favorite drink by your side.